A pledge to re-invest in the Vita, not showing the console itself, or a "scary number" could all be the cause of Sony's 24 point stock drop. Sony's Japanese stock dropped 24 points, or around 1.7% (at time of writing), following the company's "PlayStation 4 announcement" event. 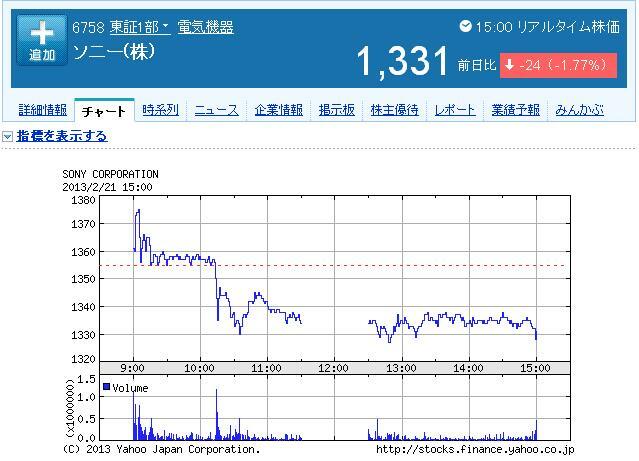 It looks like Japanese investors were not as impressed with Sony's new console as many others were. While it initially seems a little strange to have the stock drop after a big announcement, it makes a lot more sense when we look at the big picture. First let's look at what happened at the actual event. The company pledged to re-invest in the struggling Vita, the PS4 was shown to have a "supercharged PC architecture" but gave no indication of what the thing will cost, and the physical console itself wasn't actually shown. These are all things that could be worrying. These problems are then exacerbated when we remember that Japan is actually in a pretty big recession right now. Sony is struggling to stay afloat in almost all of its industries. Its TV division posted a loss for its seventh straight year and the Fitch Group recently downgraded Sony's debt to junk status. You could see how an extremely ambitious new console with dozens of new (and expensive) features could cause investors who were expecting a more modest system to reconsider their investment. Lastly, there is one more possible reason that may seem a bit... strange. Many Japanese people are incredibly superstitious, and 4 is a bad number. In Japanese, "death" and "four" can both be pronounced as "shi," so they try to avoid it in all circumstances. It's not uncommon to have level 4 on apartment buildings renamed to level 3A, or skipped entirely. Perhaps Sony could have eased some stockholders' minds by naming their new console the PlayStation 3A? Note: The original article mistakenly stated that the Kanji (Japanese character) for "death" and "four" were the same, but it turns out that this is not the case. Rather, the similarity is in pronunciation only.